Pressing for real now & The South Sound Blend — Whitewood Cider Co.
Well last week's announcement was a little premature. The apples could have been pressed but I decided to sweat them out for another week. Now it appears we'll be pressing apples every weekend for 3 consecutive weeks. 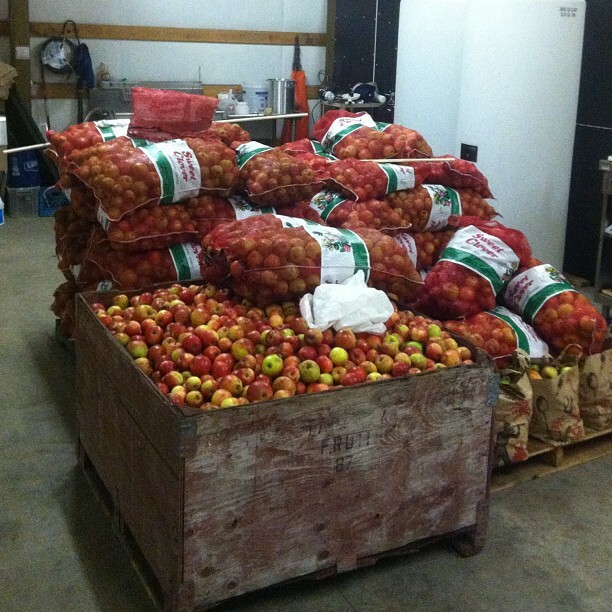 This weekend we'll be pressing almost 4000 pounds of Oly's finest locally sourced/scavenged/found heirloom apples. Thanks to much help from my brother we may have exceeded our 200 gallon goal. Looks to be closer to 300 gallons now which should fit into one of those tall white tanks behind the apples there. We'll keep you posted on our progress. We are looking for a name for this local cider blend and maybe you guys can help us. If you have any suggestions please submit your comments at the bottom of this post. The names we like we'll add to the potential list. Our stack of locally picked fruit waiting for the press this weekend. In the following weeks we'll be pressing organic heirloom Macintosh and Jonathan apples from Eastern Washington near Leavenworth. After those are done we'll be diving straight into our cider varieties for about 4 days of pressing. Wish us luck! We'll be busy in our little upstart cider house.